Fine Food or Freak Fish? Science experiments are not usually meant to be eaten; even water and gum are strictly banned from laboratories. But as scientists continue to perfect techniques for genetic manipulation, the products of their experiments are increasingly making appearances in super markets and on dinner tables. While the genetic modification of plants for human consumption is common in the United States (think corn and soybeans), genetically modified (GM) animals have yet to be approved. 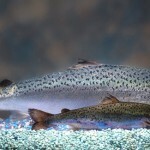 But now, a Massachusetts-based company, AquaBounty, is petitioning the FDA to sell genetically modified Atlantic Salmon to consumers. Thanks to some genetic mix and match, the salmon, dubbed AquAdvantage, reach full size faster and with less food than non-modified salmon. Typically, Atlantic Salmon produce growth hormone during warm months only. AquaBounty scientists borrowed a growth hormone gene from another salmon species, the Chinook, and hitched it to a molecular “on switch,” called a promoter, from the eel-like ocean pout. 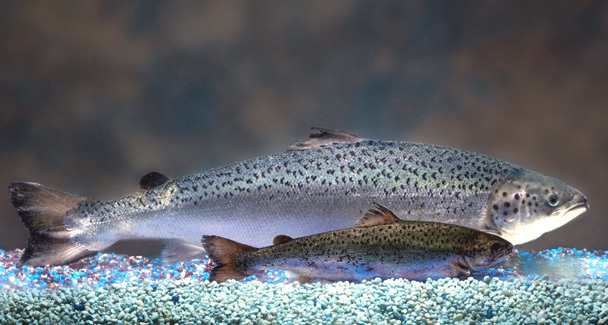 Combined, these additions to the Atlantic Salmon genome allow the creatures to produce growth hormone year-round, shortening maturation time from three years to two while reducing feed consumption by 10%. The genetic manipulation is essentially analogous to feeding cows and poultry growth hormones, a regular American farming practice. AquaBounty insists that the GM fish are identical in composition and taste to their non-modified counterparts, making them safe for human consumption. The reduced maturation time would ostensibly protect wild fish stocks and stabilize the salmon supply as seafood demand rises with the awakening of the American health conscience. AquaBounty’s assurances haven’t, however, prevented consumer advocacy groups from maligning the product as a repulsive “Frankenfish” whose approval would open a Pandora’s Box of genetic misfits that would make it onto our dinner tables. Dear reader, you likely already consume GM crops; would it bother you to eat genetically modified animals too? Print article This entry was posted by Tedi Setton on September 27, 2010 at 9:00 am, and is filed under DNA Interactive. Follow any responses to this post through RSS 2.0. You can skip to the end and leave a response. Pinging is currently not allowed.